[This is an invited article from Prof. Seideman on the recent work published in J. Physics B which illustrated how the effect of the interaction of light with plasmons on the surfaces of metal nanoparticles could be utilized to create sources of coherent and polarized light -- A work that opens up lot of other possibilities. Coherent control has been applied in recent years to a wide variety of problems, ranging from atomic physics and gas-phase molecular dynamics through solid-state physics and semiconductor device technology to solution chemistry and biology . The broad applicability of this method owes to its origin in a simple and very general concept, namely wave interference. As traditionally practiced, however, coherent control applies to large ensembles – laser beams are macroscopic objects whose focal spot size is constrained by the diffraction of light to the 10-7-10-4 m range. Molecular-scale electronics, the application of single molecules or ordered networks of molecules to make electronic or electromechanical devices, has grown during the past two decades from an inspiring dream to a technology-facing area of science. The use of electronic and nuclear molecular degrees of freedom to create transport, logic, or memory elements is conceptually intriguing, since it makes use of the quantum states of single or small collections of molecules, where coherence may be expected to have a special role. The application of coherent control concepts and tools to control electronic transport and molecular dynamics in the nano-constructs, however, requires the development of nanoscale light sources with controlled polarization and phase properties. It is here that a third established and yet rapidly growing field, namely nanoplasmonics , presents an opportunity. 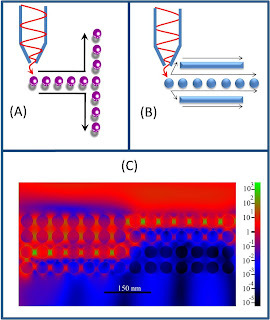 The physics underlying plasmonic phenomena is familiar from related fields such as surface enhanced Raman spectroscopy and tip-assisted spectroscopies. Similar to metal surfaces and sharp tips, metal nanoparticles enhance light that is shine upon them at frequencies (the plasmon resonance frequencies) that depend sensitively on the particle shape and size and on the dielectric constants of both the system and the surrounding medium. The origin of the enhancement is collective coherent excitation of conductive electrons in the particles, which leads to buildup of polarization charges on the particle surface. The possibility of using metal nanoparticles to focus and enhance incident light, and the sensitivity of the electromagnetic fields generated to the structural parameters and chemical composition of the material system, have been illustrated numerically and experimentally and are well understood. It is this sensitivity that is responsible for the application of nanoplasmonics to make sensors, medical diagnostics and markers. The question how to design nanoparticles and arrays thereof to have specific, predetermined optical properties and hence desired functionalities is thus both fundamentally interesting and potentially tied to applications. Recent work by the Seideman group at Northwestern University has extended concepts and tools developed for coherent control of molecular dynamics to guide light in the nanoscale via metal nanoparticle arrays and to develop nanoplasmonics with predetermined functionalities . Several simple elements in what the group envisions developing into coherently controlled nanoplasmonics are schematically illustrated in Fig. 1. The T-junction of Fig. 1a was applied to guide electromagnetic energy traveling down the leg into one or the other of the two symmetry-equivalent arms of the junction. The challenge of inducing light to bend about corners was achieved by choice of the incident field polarization. The symmetry breaking was achieved by choice of the incident field phase. Figure 1b depicts a hybrid construct, which combines elements that provide local enhancement (such as nanospheres) with elements that provide long distance propagation (such as nanowires) in order to minimize losses. The structural parameters of the construct are optimized using a genetic algorithm. Fig. 1c depicts a plasmonic nanocrystal, developed to separate an incident plane wave into two frequency components and funnel each component in a different direction normal to the direction of incidence, in parallel to the surface plane. Elsewhere the group applies genetic algorithms to iteratively build-in other optical properties into metallic and hybrid metal-semiconductor nanoparticle arrays, designing elements such as lenses and antennas with predetermined properties. The challenge of numerically developing coherent nanoscale light sources and applying them to control in the nanoscale is one of the topics of ongoing work of the Seideman group. By proper construction of single metal nanoparticles and arrays thereof, the group is able to produce spatially localized, time-resolved electromagnetic fields with predetermined phase and polarization properties. It is hoped that such sources will enable the extension of the machinery of coherent control to the nanoworld, with potential applications in the control of molecular-scale electronics, electromechanics and possibly spintronics. Wiley-Interscience, 2003); H. A. Rabitz, M. M. Hsieh and C. M. Rosenthal, Science 303, 1998 (2004). A. Ariram and M.A. Ratner, Chem.Phys.Lett. 29, 277 (1974). S. A. Maier, M. L. Brongersma, P.G. Kik, S. Meltzer, A. A. G. Requicha, and H. A. Atwater, Adv. Mat. 13, 1501 (2001); S. Link and M. A. El-Sayed, Annu. Rev. Phys. Chem. 54, 331 (2003); E. Hutter and J. H. Fendler, Adv. Mat. 16, 1685 (2004).